The Broad and Narrow Gates, by Paul Beckmann ca. 1866, from an idea and commission by Charlotte Reihlen. On the left, a big fancy arch leads to fighting, drinking, theater and animal abuse. On the right, a small gate for plainer folk leads to a fountain and a cross. 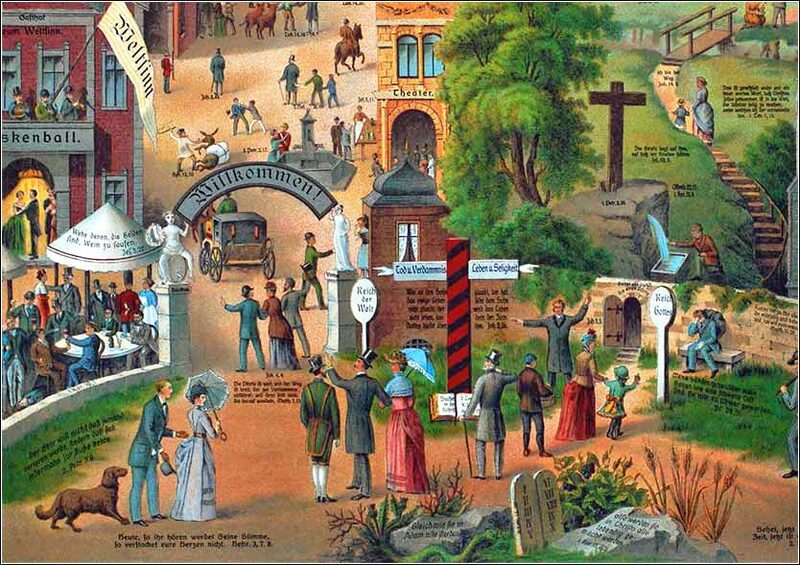 Even though the print is in German, you must look at this Full-size to appreciate it; hell and heaven are at the ends of the two roads, at the top of the full-size painting. 271 people in our community are currently praying with you. Here’s a shot of good attitude to get the week started right. Dear Lord, thank you for this beautiful day. Look after me and protect me throughout the day. Give me the wisdom to see and experience Your world in all its beauty. Let me experience the wonder of your creation. Protect my family and those closest to me. Let me share with the world today, learning, growing, and contributing, and make the world a better place for all who know me, and for those who don't. Heavenly Father, help me to see that the challenges and tests of life are actually gifts, gifts that I might have a chance to prove my sincere and single-minded faith and to grow, and endure, and persist despite obstacles in my path. For people who have it easy in life develop no strength. As you have told us, the flower of wealth and fame is short-lived, for the sun rises with its scorching heat and withers it, and its petals fall, and its beauty is gone. Give me confidence and strength in my faith, Lord. Let me hold strong and steadfast through every trial and every temptation. For I know with complete confidence that the reward you give to your faithful is true joy and will never fade, but will remain when all flesh has been corrupted and all the things of earth have faded. 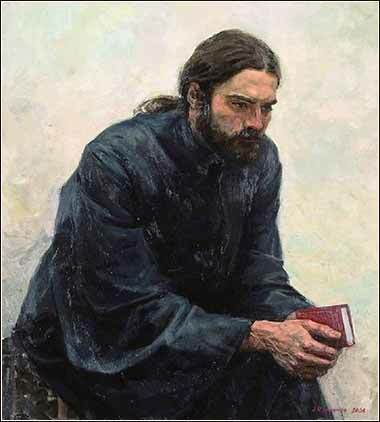 All praise and glory to you, mighty God; may you make your home with me today and every day of my life; Holy Spirit be with me now and always. Now all glory to you, great God, who is able to keep us from falling away and will bring us with great joy into your glorious presence without a single fault. All glory to you who alone are God, our Savior through Jesus Christ our Lord. All glory, majesty, power, and authority are yours before all time, and in the present, and beyond all time! The humblest citizen in all the land, when clad in the armor or a righteous cause, is stronger than all the hosts of error. “For it will be like a man going on a journey, who called his servants and entrusted to them his property. To one he gave five talents, to another two, to another one, to each according to his ability. Then he went away. He who had received the five talents went at once and traded with them, and he made five talents more. So also he who had the two talents made two talents more. But he who had received the one talent went and dug in the ground and hid his master's money. The term “talent” as a measure of money can be distracting. It can help to read $50,000 (or £50,000) for five talents, $20,000 for two talents, and $10,000 for one talent. These are roughly the amounts that Jesus was talking about. The parable is very long and cannot be subdivided, and there is a lot of meat in it; so, to keep the commentary from running too long, we will look at it some more, tomorrow. The broad outline is not difficult to understand. The master is God, and the talents he gives them represent everything God gives us in our life, generally, and the grace we receive from the sacrifice of Christ, specifically. If it seems odd that the word “talent”, a measure of money, is used here as a metaphor for what we would call “talent” — our gifts, our inherent aptitude to accomplish some goal — it is no accident. Our meaning of “talent” comes directly from this very parable! We get a number of things by accident of birth. Our intelligence, aptitudes, beauty, athleticism, support in childhood, education, often some money — not to mention, life itself. The list is endless. These are given to us, directly or indirectly, from God. And then God, in a sense, goes away. He lets us decide how to use what we receive. If we use our natural gifts productively, God is pleased. If we spend our lives watching television and eating Cheetos, He is not pleased. But that isn't what Christ is really about here, is it? God may be happy enough for us if we work hard at honest labor and make a better life on earth — He did command us, after all, “be ye fruitful, and multiply; bring forth abundantly in the earth” (Genesis 9:7) — but that is hardly the message of Christ. Christ is more concerned with our salvation, and the increase He demands are fruits of the spirit: How much we have loved God and our neighbor. Have we have used our talents to help others, both in worldly terms and in terms of increasing their life in Christ?